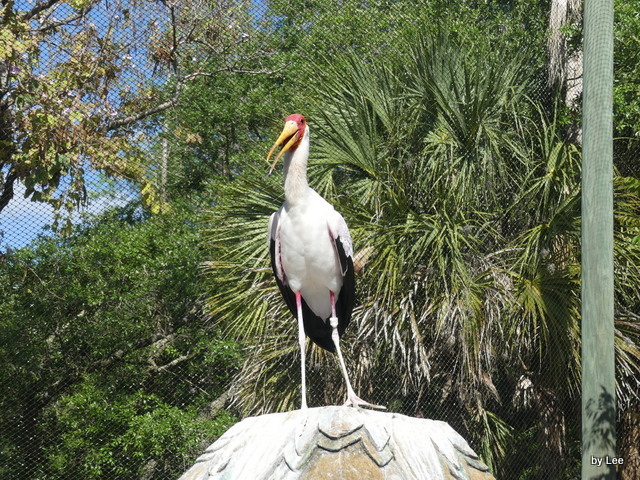 We were at Lowry Park Zoo, now called Zoo Tampa at Lowry Park, and saw the Yellow-billed Storks in the Sulawesi aviary. This was the first time we have seen them in there. It gave a great opportunity to watch them up-close. Really, up-close! It was great! 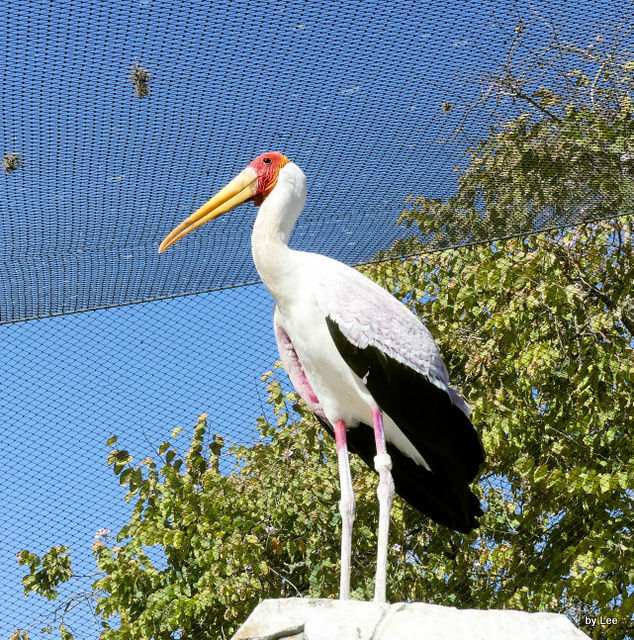 Storks are mentioned in the Bible in five verses in the KJV. Leviticus 11:19, Deuteronomy 14:18, Psalm 104:18, Jeremiah 8:7, and Zechariah 5:9. The first two verses have to do with the “Do Not Eat” list, the next two with nesting and migration, and the last with a prophecy. 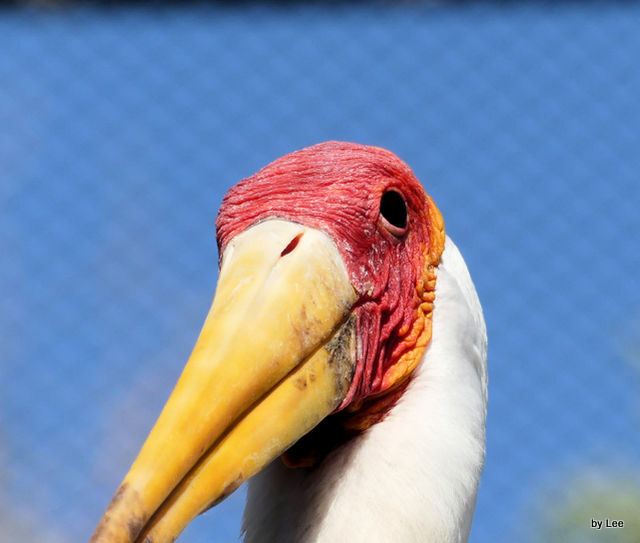 The Yellow-billed stork (Mycteria ibis), sometimes also called the wood stork or wood ibis, is a large African wading stork species in the family Ciconiidae. It is widespread in regions south of the Sahara and also occurs in Madagascar. 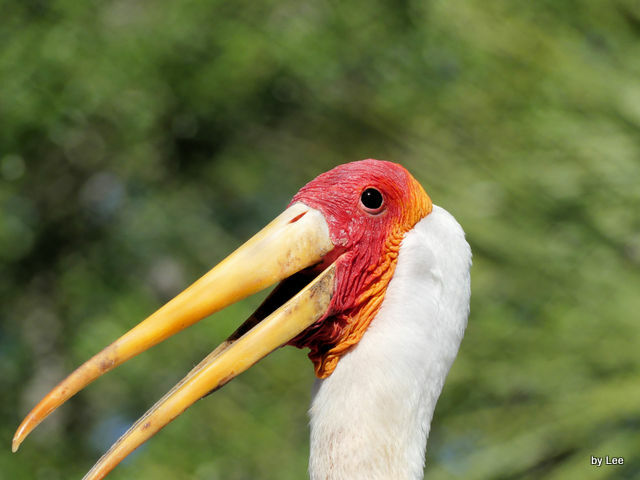 The yellow-billed stork is closely related to 3 other species in the Mycteria genus: the American woodstork (Mycteria americana), the milky stork (Mycteria cinerea) and the painted stork (Mycteria leucocephala). It is classified as belonging to one clade with these 3 other species because they all display remarkable homologies in behavior and morphology. 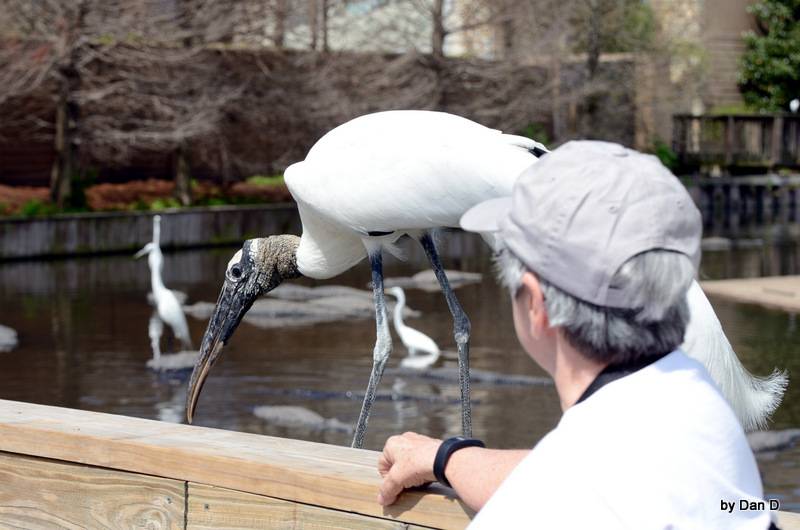 In one analytical study of feeding and courtship behaviours of the wood-stork family, M.P. Kahl attributed the same general ethology to all members of the Mycteria genus, with few species-specific variations. 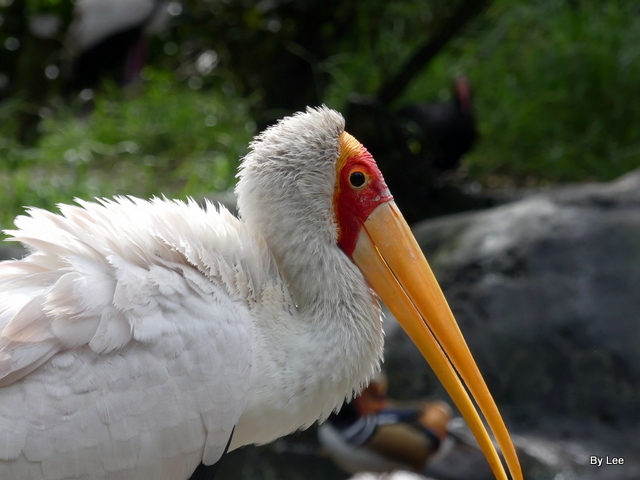 [Probably only one of that genus was onboard the Ark] These four species are collectively referred to as the wood-storks, which should not be confused with one alternative common name (wood-stork) for the yellow-billed stork. 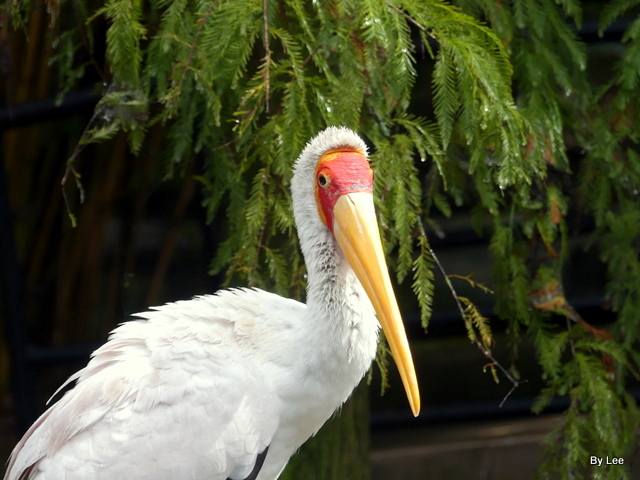 It is a medium-sized stork standing 90–105 cm (35–41 in) tall. The body is white with a short black tail that is glossed green and purple when freshly moulted. The bill is deep yellow, slightly decurved at the end and has a rounder cross-section than in other stork species outside the Mycteria. 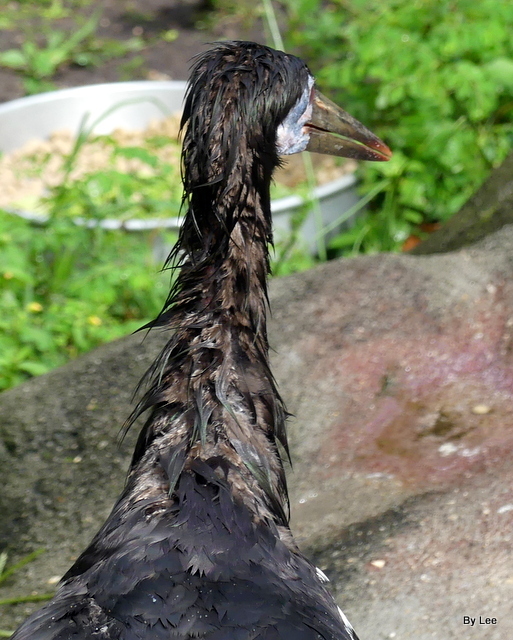 Feathers extend onto the head and neck just behind the eyes, with the face and forehead being covered by deep red skin. Both sexes are similar in appearance, but the male is larger and has a slightly longer heavier bill. Males and females weigh approximately 2.3 kg (5.1 lb) and 1.9 kg (4.2 lb) respectively. Colouration becomes more vivid during the breeding season. 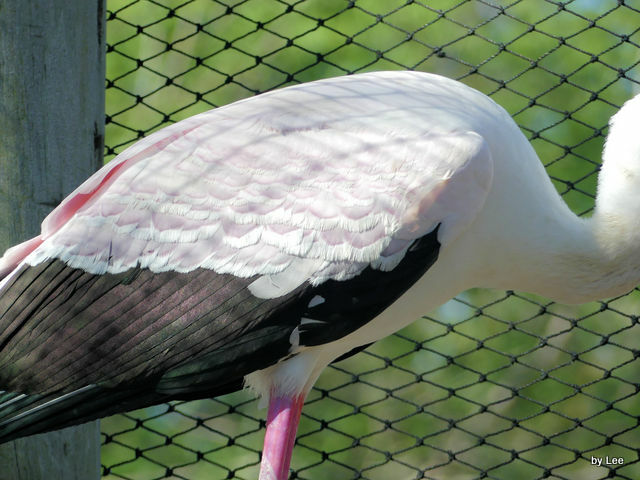 In the breeding season, the plumage is coloured pink on the upperwings and back; the ordinarily brown legs also turn bright pink; the bill becomes a deeper yellow and the face becomes a deeper red. Their diet comprises mainly small, freshwater fish of about 60-100mm length and maximally 150g, which they swallow whole. They also feed on crustaceans, worms, aquatic insects, frogs and occasionally small mammals and birds. This species appears to rely mainly on sense of touch to detect and capture prey, rather than by vision. They feed patiently by walking through the water with partially open bills and probe the water for prey. Contact of the bill with a prey item is followed by a rapid snap-bill reflex, whereby the bird snaps shut its mandibles, raises its head and swallows the prey whole. The speed of this reflex in the closely related American woodstork (Mycteria americana) has been recorded as 25 milliseconds and although the corresponding reflex in the yellow-billed stork has not been quantitatively measured, the yellow-billed stork’s feeding mechanism appears to be at least qualitatively identical to that of the American woodstork. In addition to the snap-bill reflex, the yellow-billed stork also uses a systematic foot stirring technique to sound out evasive prey. It prods and churns up the bottom of the water as part of a “herding mechanism” to force prey out of the bottom vegetation and into the bird’s bill. 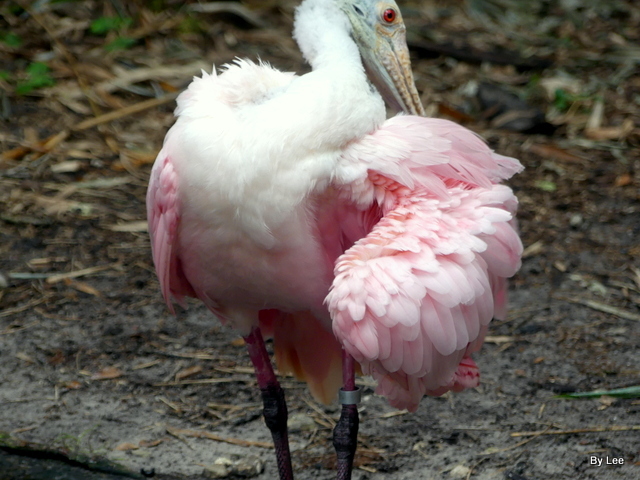 The bird does this several times with one foot before bringing it forwards and repeating with the other foot. 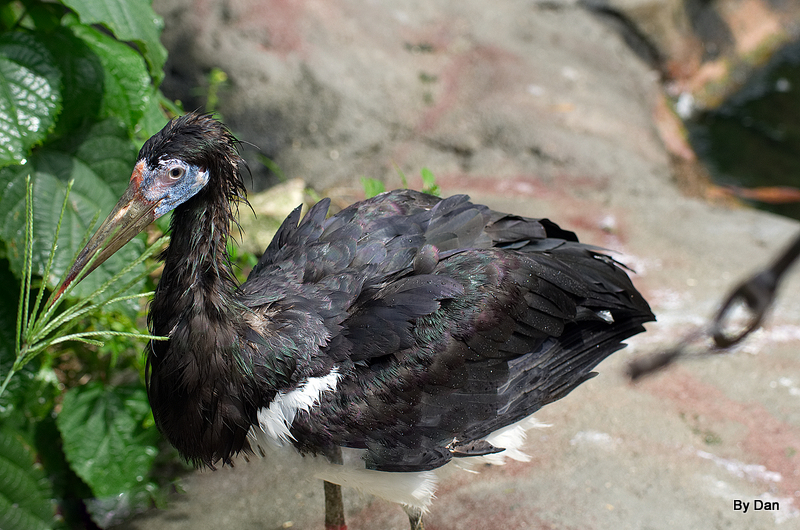 Although they are normally active predators, they have also been observed to scavenge fish regurgitated by cormorants.